One of the smallest countries in South America, lying on both the Northern and the Southern Hemispheres and divided by the equator, Ecuador is a country known for having the largest biodiversity per square kilometre in the World. Separated into four very distinct regions, Ecuador allows you in a very real way to explore 4 different worlds in one country. With the stunning Andes Mountains running down the center of the country, the biologically rich Amazon rainforest to the east, the low-lying Pacific coast region to the west and, of course, the unique world of the Galapagos Islands 600 miles off shore, the options for touring in Ecuador are limitless. Located high up in the Andes the capital city of Quito, the World's first World Heritage Site, is the entrance point for the rest of the country. 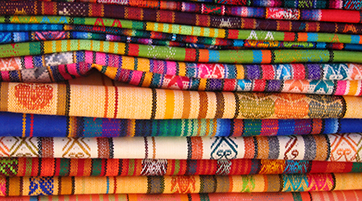 The beautiful towns and artisan communities in the Andes are amazing cultural attractions; you can visit indigenous markets and the homes of weavers, woodcarvers, and other folk artists. The Andes Mountains are among the most beautiful. Formed by volcanic eruptions from the earth's core some sixty million years ago; nowhere is this more apparent than in the Riobamba region of Ecuador where 8 active volcanoes, stretched across approximately 300 kilometres, form the Avenue of the Volcanoes and is home of the majestic snow capped Cotopaxi Volcano, the world's highest active volcano and imposing Chimborazo, the country's highest peak. To see the country a different way board the exclusive and unique "Chiva Express" and enjoy a leisurely, colourful ride along the original railroad descending from the Andes to the coast. Ecuador's upper Amazon basin, also known as the Oriente, is a whole different world. Deep, dense and mysterious even to those who know it. Filled with a thousand varieties of lush plant life, strange and exotic animals and primitive Indian cultures it is among the most complex of ecosystems and will offer a true jungle adventure. A modern Garden of Eden and a living laboratory of evolution, the Galapagos are nothing less than spectacular and have recently been nominated as one of the seven natural wonders of the World. The Islands are peaks of enormous underwater volcanoes; having never been connected with the South American continent, Galapagos' flora and fauna developed in complete isolation, a fact that in many ways allowed Charles Darwin to form his theory of evolution. The Galapagos are truly a wonder that should not be missed. Where else can you swim with hammerhead sharks, penguins, sea lions, and hundreds of tropical reef fish and sleep on a volcanic peak? Cruise around the Galapagos Islands and enjoy a truly beautiful, once-in-a-lifetime experience!